Add an extra layer of protection to your baby’s mattress without compromising on comfort with the Babyrest Waterproof Mattress Protector. 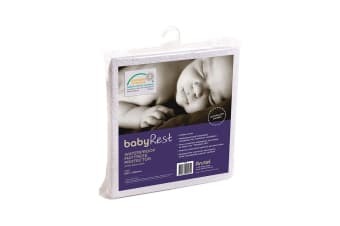 The Babyrest Waterproof Mattress Protector offers comfort to little ones and peace of mind to parents. It features a waterproof and breathable membrane for optimum comfort, ventilation and absorbency, making it baby and mother friendly.